A high performance, low maintenance, high modulus, fungal resistant silicone sanitary sealant. This one part silicone sealant has excellent adhesion to a wide range of commonly used materials including ceramics, glass, melamine laminates and sanitary plastics. S3 Sanitary Sealant is also compatible with anodised aluminium and lacquered metals making it perfect for a wide range of jobs for both DIY domestic work as well as trade and commercial applications. 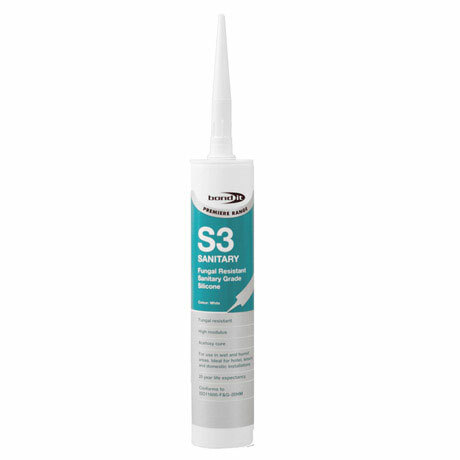 Bond It S3 Sanitary Sealant contains a biocide which helps to prevent unsightly mould growth and improves sanitation. Bond It S3 Sanitary Sealant has been specially designed to seal in damp and humid areas so it can be used for sealing around worktops, basins, sinks, bed basins and vanity units. It can even be used to seal shower trays and shower units. For sealing waste outlets in sinks and baths: S3 Sanitary Sealant should be applied so that it will be in compression after tightening of connecting pipes. Please note: For metallised plastic trims: test for discolouration by sealant before use. Container Size - EU3 cartridge.